My last class to review from The Grand Tournament is the Warrior class. The class was gifted with the Grim Patron card in the Blackrock Mountain expansion, with a lot of decks based on the Grim Patron and Warsong Commander dynamic. There were plenty of new aggro Warrior decks that was based on damaging own minions which made a nice change from the standard control Warrior decks. With the exception of Sea Reaver, there is a limited effort towards damaging minions for buffs. The Grand Tournament cards this time round seem to lean back towards the larger control game with armour and taunt being a key feature. I like cards such as Bash, which deals 3 damage and gains 3 armour, is good value for a control deck. There’s the continual gain of armour whilst some slight board clear at the same time. It seems as though Taunt will be a new feature of Warrior decks, as Bolster, King’s Defender and Sparring Partner all interact with taunt minions in some way. More taunts will make the Warrior even harder to kill, and to get the most effect of Bolster there could be more Defender of Argus and Sunfury Protectors could make more annoying taunts to get through. A definite slower game for Warrior but one that could be very effective. 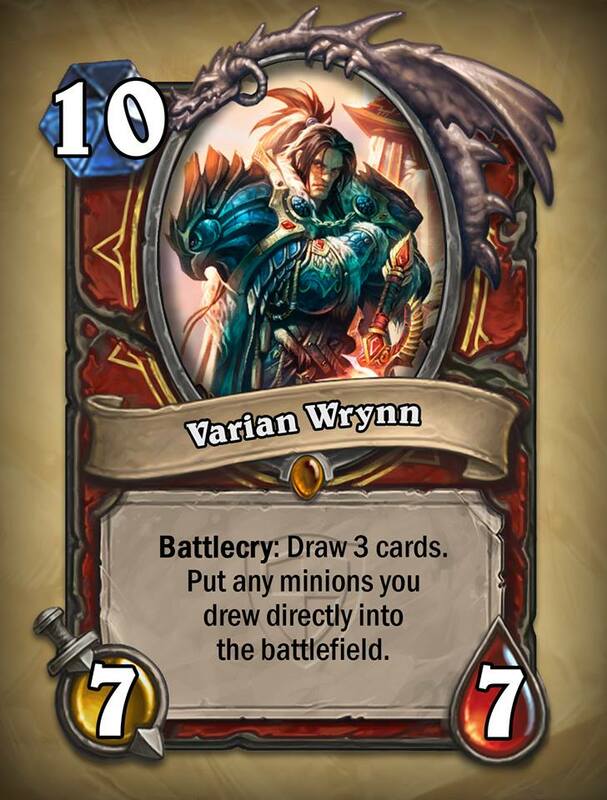 My favourite new Warrior card has to be the new legendary Varian Wrynn, a 10 mana 7/7 that draws 3 cards and lays any minions drawn straight onto the board. This could be insane value, imagine in a new taunt deck being able to summon two Sludge Belchers as well as a big 7/7 minion. There is definitely the risk of pulling out minions that would nullify the battle cries i.e. Alexstrasza who is a common inclusion in Warrior decks. You could pull out some cheap minions, which wouldn’t be as valuable but it’s still worth the mana in my opinion. A strong card that I hope to get in a pack sooner rather than later! Emma and James’s favourite Warrior Card: Varian Wrynn – we all agreed on the same card, it had to happen in one class! With a lot of value, this card should be included in a lot of Warrior decks, if you’re ever lucky enough to open it! Emma’s Worst Warrior Card: Sea Reaver – an attempt at being cohesive with Grim Patron decks but a bit too situational could just annoyingly kill own minions and not help the game at all. James’s Worst Warrior Card: Magnataur Alpha – the minion is too fragile for the cost, it’s going to die very quickly so not great value. I will look at a few neutrals tomorrow, then my Grand Tournament card overview will be over! The expansion is now live, and I have a few packs to open, and hope to have some good cards to try out!